Otis Bowen was born in Richland Center, Indiana. He received a bachelor's degree in chemistry from Indiana University in 1939, and his M.D. degree from Indiana University School of Medicine in 1942. From 1943 to 1946, Dr. Bowen served in the Pacific during World War II as a member of the U.S. Army Medical Corps. He was corner in Marshall County, Indiana from 1952 to 1956. Dr. Bowen served as a member of the House of Representatives in Indiana in 1957, 1958 and 1961-1972. He was governor of Indiana from 1973-1981. 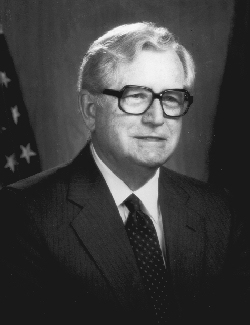 From 1981 to 1984, he served on the Advisory Council on Social Security. In 1985, President Ronald Reagan appointed Dr. Bowen Secretary of Health and Human Services, a post he held until 1989.